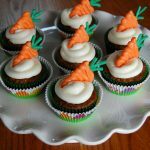 My favorite spice cake, filled with shredded carrots, crushed pineapple, coconut, chopped pecans and sweet raisins, topped with cream cheese frosting and these cute candy carrots! CAKE: Preheat oven to 350 degrees. Line two standard muffin tins with 24 paper cupcake cups. In a medium bowl, whisk together flour, cinnamon, soda and salt; set aside. In a large bowl, beat sugar, eggs and oil until well combined. Gradually add flour mixture, beat until combined. Stir in shredded carrots, pineapple, coconut, pecans and raisins. Pour batter into cupcake cups filling them 2/3 full. Bake for 20 minutes. Cool in pan for 10 minutes, and then remove to wire racks to cool completely before frosting. CREAM CHEESE FROSTING: In a large bowl, beat together cream cheese, butter and confectioners' sugar. If too stiff add lemon juice until spreading consistency is achieved. Pipe or frost cupcakes and decorate with a candy melt carrot if desired. CANDY MELT CARROTS: Line a baking sheet with wax paper. Melt the green candy melts per the package instructions then transfer to a resealable plastic bag or piping bag. Cut off the tip and pipe the greens of each carrot. Melt the orange candy melts per the package instructions then transfer them to a resealable plastic bag or piping bag. Cut off the tip and pipe the shape of a carrot partially overlapping the bottom of each green stem so they stick together. Place the baking sheet in the refrigerator for 5 minutes or until the candy melts have fully hardened. Using an offset spatula, carefully release each carrot from the baking sheet and place on top of the frosted cupcakes.